2 More Reasons to Sell the Aussie? The Aussie has been getting hammered on the charts for the past few weeks! For the most part, the aggressive selling started when the RBA cut rates to their record-lows in May. This didn’t bode well for the Aussie especially since other central banks expressed their intentions to actually start tightening. Another thorn on the Aussie’s slide has been the decline in gold prices. As I’ve said before, the metal is one of Australia’s biggest exports and shares an 80% correlation with the Aussie. Unfortunately, gold has been on the decline since April. #1:	The RBA is still dovish. It held rates steady at 2.75% during its rate statement yesterday. However, central bankers in the Land Down Under hinted that they may not be satisfied with the 8% decline we’ve seen in AUD/USD yet. The statement said that the currency is still trading at high levels considering the drop in export prices. To top it off, the central bank thinks that inflation still has room to accommodate further easing! #2:	Australian economic data has been awful. Simply put, the economy isn’t performing as well as we expected — take it from the latest GDP report. The Australian economy grew just 0.6% in Q1 2013, amidst forecasts that called for a growth of 0.8%. Lower spending in machinery and equipment, which declined by 6.9%, contributed a lot to the sub-par results. In fact, it’s estimated that this alone is responsible for shaving 0.4% off GDP growth. Meanwhile, public spending posted a whopping 15.3% drop in the quarter as well, which translates to a loss of 0.9% in growth. But every dark cloud has its silver lining, and in Australia’s case, it came in the form of household spending. Households ramped up their spending by 0.6% last quarter, which helped bring GDP growth up by 0.3%. Likewise, the construction industry powered through in Q1, surging by 7.6% and lifting the economy by 0.6%. So far, it seems as though the RBA’s record-low interest rates have been boosting consumption, but business investment hasn’t been showing the same positive reaction. Given these, many believe that it’s only a matter of time before the RBA cuts rates again. Some even say it could happen within the next two months. Consequently, such talk has only led some market junkies to think that we could see the Aussie tumble even further down the charts in the next few weeks! But of course, this is all pure speculation at the moment, and nothing is set in stone. Keep in mind that other major economies are set to hold major events (BOE and ECB rate statements) and publish hard-hitting reports (U.S. NFP) later in the week, and these could affect the market’s demand for the Aussie. 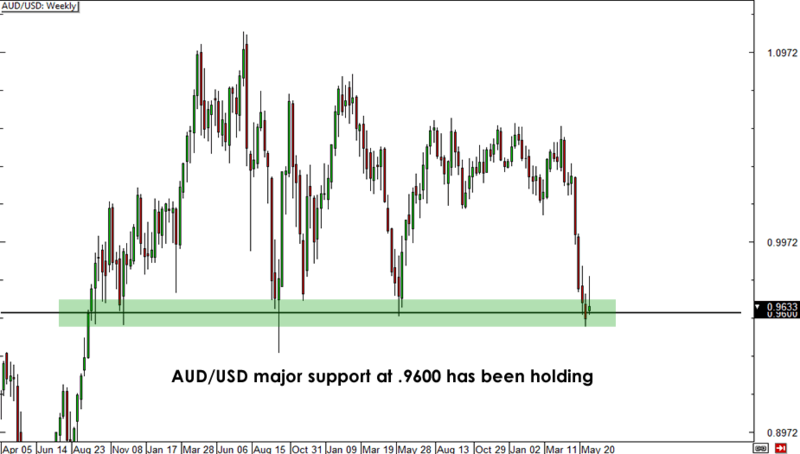 It’s also worth noting that AUD/USD is currently testing a major support level on the weekly time frame. The market was unsuccessful in crossing this level in the past – it may just fail to trade below it once more. Do you think the Aussie will drop even further in the next few weeks?